Trusted by millions of professional photographers worldwide, Nikon’s precision lenses help you shoot super-sharp images with striking contrast and vivid colour. Whatever your photographic passion, Nikon has a spectacular lens to enable you to capture unforgettable shots. Always innovating, producing 95 million lenses to date, and with 90 in the current range, there’s a Nikon lens for every area of photography. 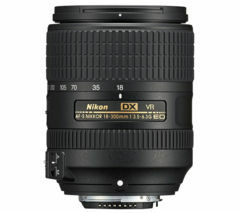 Choose from its legendary Nikkor lenses for Nikon SLR cameras and its 1 Nikkor lenses for Nikon 1 cameras. 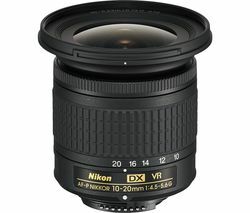 This Nikon wide-angle lens is ideal for capturing sweeping landscapes and city skylines, light and portable travel lenses like this are flexible enough to shoot landscapes, portraits and fast action, telephoto and super-telephoto lenses get right to the heart of the action, and micro-lenses reveal every textured detail for the ultimate close-up. All Nikon lenses operate with a silent focus, allowing you to get up close without disturbing the scene. Autofocus lenses are fast, precise, and super-quiet, and Nikon’s Vibration Reduction system enables blur-free images and lets you shoot at up to four stops slower. Extra-low dispersion glass elements help minimise chromatic aberration for high-contrast images, and Nikkor lenses can now be fitted to 1 Nikon cameras using the FT-1 Mount Adapter. A professional favourite for decades, if you’re looking for innovative, affordable, precision lenses for your camera, industry-leading Nikon lenses are ideal. Take a look at our range of Nikon DSLR cameras and find a camera and lens to suit your needs.